My Scottie Hampton sunglasses are really coming in handy while here. The blue water in the Mediterranean looks ten times bluer as I begin to arrive with my crew to Stromboli. There is something about the polarized effect that keeps me in line from the beating rays of the sun as I lead my crew through the blue waters. After a late night in Lipari boats had to make their way East to Stromboli by around noon in order to make it in time for the highly coveted Volcano trek. Stromboli doesn’t have much of a marina and ninety five percent of the island consists of a 4,500-meter high volcano. Only the most ambitious (and sober) crews dared to sign up for the volcano trek. Participants convened in the town square up in front of the church overlooking the boats moored or anchored off the southeast side of the island. After about an hour of staging – sorting out which guides would take which groups and renting the appropriate hiking gear such as boots, lights, water etc. – the crews were ready to go. The hike up takes a little over two hours and goes through dense brush with steep technical climbs and then gives way to a vast open slope of volcanic ash and rock. The path has several switchbacks all the way to the top and as the sun set and hikers turned on their headlamps the hundreds of little lights illuminated a serpentine path all the way to the top of the volcano. Hikers had to be constantly on the lookout for rocks rolling down the mountain face from other climbers jostling them lose. Once we arrived at the top, the guide briefed everyone on how frequently we would hear explosions and what to do if the Sulfuric smell or high winds became too much. We all sat on the ridge looking down into the first crater awaiting an explosion. It was similar to lying down to watch for shooting stars. The night was so clear we could see every star in the sky and if people happened to be paying attention a few shooting stars did fly by. The explosions would spray molten hot volcanic ash down the slope away from where we were sitting. In the dark evening light the red-hot rock could be seen from sea level on the north side of the island. We then continued up over the other side of the volcano to the second and third craters. The second crater had a constant flame blowing out of it, which flickered in intensity. The third crater was relatively inactive but the guides said it does have explosions from time to time. It was about 10:00pm once we decided to make our way back down the other side of the volcano. We proceeded down a vast slopping expanse of very fine volcanic ash. It was very plush and everyone's feet would sink in past their ankles. After about a kilometer of this fine ash the path made it’s way back into the brush and back into town. It was about midnight once the last groups made their way back to the city center. They had no time to lose before making their way to the club for the night! 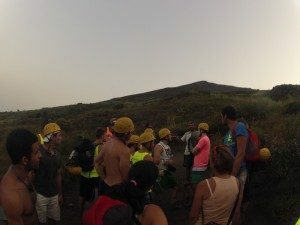 The most ambitious crews celebrated their five hour excursion to the top of the volcano with a long night of partying at a club nestled in the rocks right on the beach at the base of the volcano. The party started around midnight and continued until the sun came up.